Turn Your Old Money To New Money! NEWPORT BEACH (18 February 2010) — Now available, What to do with Granddaddy’s Coins is the essential tool needed to take advantage of the present lucrative numismatic trade. Beginners have been awaiting the arrival of this ideal handbook to learn how to get the most favorable profit from miscellaneous coins in today’s cutthroat market. Written with the non-coin collector in mind, this book guides the reader to identify coins and their values, and advises what to do with them without risking the loss of a great reward. Numismatic expert Jeff Ambio provides direct and impartial counsel to readers on how to confidently discuss their coins, effectively work with dealers/auction houses and make sensible decisions when the time comes to sell. All the basics of dealing with old coins are covered in this comprehensive guide. • A chapter discussing needed supplies. • How to properly care for coins without risk of devaluing them. • What makes a coin valuable in today’s numismatic market. • What to expect when working with dealers and auction houses. Ideal for anyone who has come into a coin collection, this book is the only one on the market written for non-collectors to gain the most advantageous benefits from their coins. 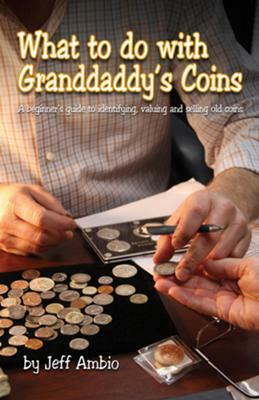 Currently available, What to do with Granddaddy’s Coins is a helpful resource for the non-collector who has acquired a potentially valuable inheritance. Contact: Leila Benoun, Zyrus Press, at www.zyruspress.com.